Clouds will thicken overnight and that will help keep it a warm one. We're still in the 60s as I update at 11:26 pm. 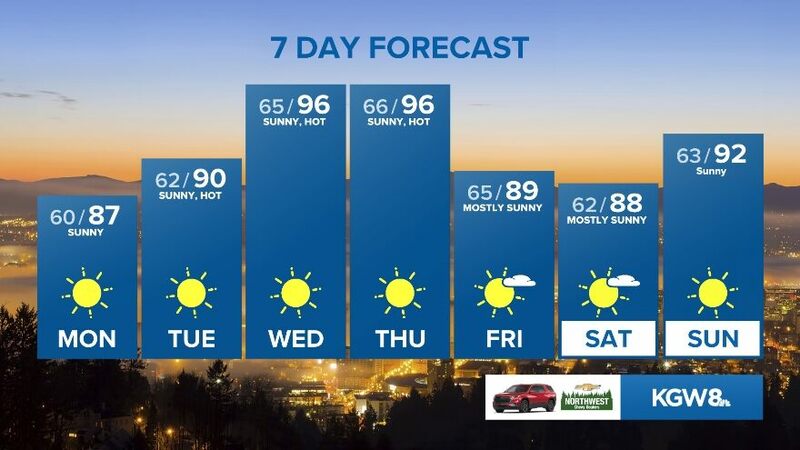 Portland hit 75-degrees Thursday for the first time since October 17. Yep, it’s been six months since we’ve had a day this warm. We probably shouldn’t expect more days that warm anytime soon. Historically, Portland has only hit 75-degrees in April 7.6% of the time. Rain turns to showers Friday, and western valley highs will top out around 60-degrees. But the rain will be mainly light and broken up. After Friday’s rain, warm and dry weather returns this weekend and continues into next week. But the clouds clear overnight into Saturday morning. With afternoon sun, look for highs in the mid-60s Saturday. Easter Sunday will be mostly sunny and a little warmer, with highs in the upper 60s. The dry weather hangs on Monday and Tuesday, with highs in the upper 60s and a partly sunny sky. Showers will return Tuesday night and Wednesday.